This is to inform you of your long overdue Payment outstanding with our Banking records. This is to inform you that your name came first from our Central Computer among the list of unpaid Inheritance claims individuals and have to update your information through this email contact for immediate confirmation. Your name appeared among the beneficiaries who will receive a part-payment of US$2,500,000 million (Two Million Five Hundred Thousand United State Dollars) and it has been approved already for payment months ago. However, we received an email from one Mr. Morris Lint, who told us That you are dead and he is your next of kin and that you died in a car Accident four months back. To our findings we discover that this Morris Lint is a liar and imposer that is why we contact you before any release of funds can be paid to him. He has also submitted his Account information to the Accounting office department of our Bank for Immediate transfer of the fund to him as your inheritor. Regarding our investigation from the Bank & the Nigerian Police Force (N.P.F) in conjunction with the Economic Financial Crime Commission (E.F.C.C) we are now verifying by contacting your email address as we have in our Bank records before we can Make the transfer into his account and for us to conclude with confirmation if you are dead or not. Please, confirm response immediately through the e-mail as below with Proof, before our action release of the outstanding payment against your name listed out. Upon this, i request you send your full personal information as soon as possible to enable this department finalize The transfer of the fund release to your nominated foreign Bank Account. This department needs the following information From you urgently to enable us verify with the Information we have in the Central computer of the Bank. 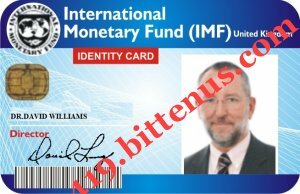 Once again, I apologize to you on behalf of International Monetary fund Agency towards this contact and proper confirmation required urgently from you if alive. As soon as the above details have been confirmed by me, it will enable me apply for Sworn Affidavit Certificate that will be boldly written that you are still alive as you claimed. The sworn Affidavit Certificate, will cost you little amount and in the other hand for more proof and verification you can travel down to Abuja Nigeria to see the man who claim you are dead, i have to go to the federal high court to swear an affidavit on your behalf and present it before the bank stating that you are still alive, beneficiary of the unclaimed fund. However, if you are not pleased with this you can as well travel down here to secure the document yourself it will make it easier and faster. Attach with this email was the picture we took with Mr. Morris Lint when he came to our office, please be fast about it so that i can put things in place Mr. Morris Lint must face the law for impersonation and attempted fraud.